UPPER EAST SIDE — It’s 11 a.m. and the cooks at the Lenox Hill Neighborhood House are busy. One of them mixes together cinnamon and vanilla for homemade granola, while another chops onions for a curry and a third zests lemons for a chicken dish. While this may be a typical sight in the kitchen of any New York City restaurant, it’s unusual for an institution that serves more than 1,000 meals each day to mostly seniors and children from low-income families. Many programs that feed people on such a large scale rely on pre-made, frozen foods that simply need to be re-heated. In 2012, the Lenox Hill Neighborhood House transformed its food service from the typical institutional model to a farm-to-table program that uses more than 90 percent fresh produce and locally sourced grains, fish and meat, all without breaking its operating budget. Now, after two years, the nonprofit will begin to teach other institutions how to provide farm-to-table meals on the cheap using $7,500 in grant money from the United Neighborhood Houses to develop a training model. They plan to partner first with the Jacob Riis Settlement House in Long Island City, and are applying for a larger grant from the USDA that would allow them to expand the training program to other institutions. The nonprofit was founded 120 years ago to provide social services to the East Side community. Today, it serves 20,000 people — or 350,000 meals — each year through its two East Side senior centers, at Head Start and after-school programs, and a homeless shelter for women living with mental illnesses. In late 2011, Lenox Hill received a grant from the city to develop an innovative senior center, one of eight citywide that would serve as a model for other programs. As part of this process, the nonprofit decided to overhaul its food program. They hired Lynn Loflin, owner and chef of the popular West Village restaurant Miracle Grill, to oversee the program. After closing Miracle Grill, Loflin started her own farm in the Catskills and later developed cooking and nutrition programs for nonprofit organizations. When she heard about the job opening at Lenox Hill, she jumped at the opportunity. Loflin started small, swapping out frozen vegetables for fresh ones whenever possible, but that was only the beginning. Fresh foods require different kinds of storage than frozen foods, so the facility had to be updated. The staff, used to working with prepared meals, had to shift their focus to following recipes and improving their knife skills for the much more intensive food prep. Loflin also had to find budget-friendly sources for fresh, local foods to replace the frozen ingredients. 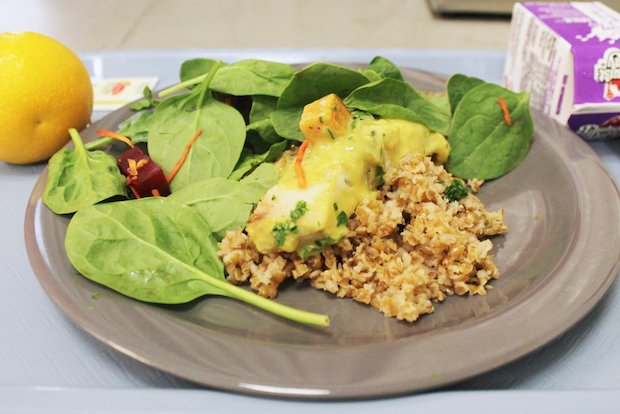 Today, the kitchen turns out homemade meals such as frittata with locally grown spinach and potatoes, and pollock from the Gulf of Maine cooked in a coconut curry sauce, spiced up by cilantro from the center’s rooftop garden. And at about $3 per meal, Loflin has been able to keep the costs on par with the frozen foods. She said that the on-budget transformation would not be possible without key partnerships. Lenox Hill gets most of its local produce, meat and grains through Greenmarket Co., the wholesale distribution service run by the city's GrowNYC program, which brings products from upstate farms to city customers at a reasonable price. Lenox Hill also works with vocational high schools and CUNY to provide internships for students interested in the culinary arts. The clients seem happy with the change. Emily Blake, 79, another frequent diner there, also appreciated the focus on healthy cuisine. Loflin said that the transformation is still a work in progress, but envisioned a day when the Lenox Hill kitchen is on par with that of any farm-to-table restaurant.